Proceeds from each sale benefit the Carolinas Golf Foundation. Thanks for your support of the CGA! If you have a vehicle in NC, support the Carolinas Golf Foundation with our logoed license plate. Personalize it with 4 characters of your choosing. $20 of each plate fee benefits the CGF. 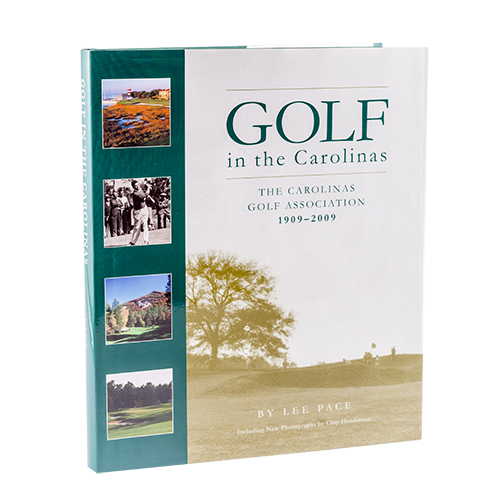 Written by renowned golf author, Lee Pace, is a celebration of golf and 100 years of golf history in the Carolinas, coinciding with the first 100 years of the Carolinas Golf Association. Read about the history, the players and the venues that have made golf in the Carolinas the best over the last century. “Golf in the Carolinas” includes stunning photos of today’s courses and Carolinas golf legends.